To most people archaeology conjures up exotic images of digs in far way places like China, Egypt or South America. We have visions of ancient artifacts like gold coins and pottery, cliff dwellings and pyramids. And while those romantic images are familiar, they mask a really important fact that every place on earth has a past and that past history is very important. Well the aim of archaeologists is to develop mankind’s understanding of how its behaviour has changed over time and the reason for those changes. An archaeologist searches for evolutionary patterns associated with major cultural developments like the collapse of large civilisations, the development of new processes like farming and how cities emerge. Archaeologists search for better ways to predict how different cultures around our planet will change over time and most important of all how mankind can better plan its future. This site is dedicated to the awards which recognise the immensely valuable role archaeologists play in our society. The prestigious British Archaeological Awards were held in Central Hall Westminster on 15th October 2018. These awards held every two years are Britain’s only independent sector-wide archaeological awards, celebrating and showcasing the best in British archaeology. Professor Carenza Lewis was the compere for the evening, well known to many for her contribution to the popular Time Team TV programme. This project encouraged and facilitated public participation in the dynamic archaeology of the River Thames inter-tidal zone. Top honours for Archaeologist of the Year at the prestigious Current Archaeology Awards for 2018 went to Dr Hella Eckardt of the University of Reading. A specialist in social approaches to Roman archaeology, she explores social and cultural identity in antiquity, and her latest monograph Writing and power in the Roman world: literacies and material culture considers relationships between the material culture of writing and sociocultural identities. The 20th European Archaeological Heritage Prize has been awarded to Ivan Pavlů in recognition of his long-lasting European-wide contributions to the study of Neolithic settlements, with particularly important achievements in terms of scientific methodology and heritage management. 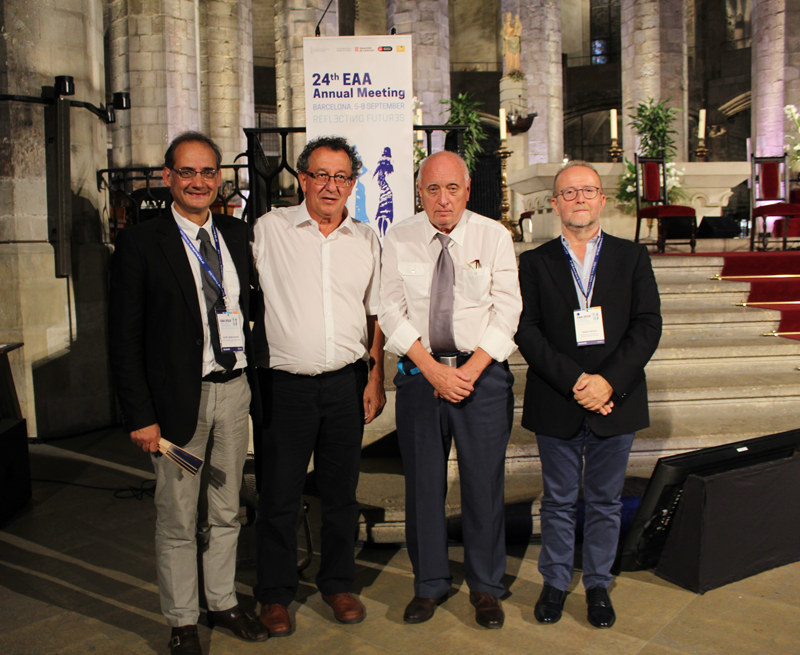 The award was also conferred upon Francisco Javier Sánchez-Palencia Ramos in recognition of his international expertise in the study of Roman mining activities and industrial landscapes, as notably evidenced at the World Heritage Site of Las Médulas. Instituted in 1990 to permit SAA to recognize individuals who have provided extraordinary services to the society and the profession in the past year. Awardees are determined by the president of the society, in consultation with members of the Executive Board. For her dedication to the understanding of and advising on one of the most important, always evolving, and challenging issues, namely, repatriation; her articulate and fair insights and assessments; her committee leadership and willingness to travel for the best interests of the Society; and for her professionalism, sense of equity and balance, and always timely advice. Keeping track if a plethora of artifacts during the course of a large project can be quite challenging. However, the advent of cloud based audit management software which can catalogue artifact findings with both comprehensive data and visual records has proven to be a great asset. With instant uploading to an online database, dig audits can be kept right up to date and accessed anywhere in the world enabling greater real time collaboration.